Becoming a first-time homeowner is one of the most exciting and stressful times of your life, even after the closing papers have been signed and key is in hand. Suddenly, you’re faced with a whole new set of challenges: how to manage a home that’s yours, not your landlord’s. There are a lot of opportunities to learn—and as you learn, mistakes will be made. Luckily, many new homeowner mistakes can be easily avoided with a little preparation. Don’t let the following potential mistakes damper your excitement. Instead, plan ahead and keep these tips and tricks in mind as you learn the ropes of being a homeowner. You likely just did a walk-through with a licensed inspector during the homebuying process, so you’re aware of what issues need attention and which can wait. That’s not where home maintenance stops. Home maintenance includes tasks you may have never thought of before, like cleaning the gutters, power-washing the house, prepping your pipes for winter and much more. The best way to avoid missing these critical tasks, which could lead to costly damage, is to set up a quarterly or monthly maintenance schedule for all of the areas of your home. This should include indoor and outdoor maintenance as well as details like plumbing and electrical. Use this checklist from Better Homes and Gardens as a starting point to creating one that’s specific to your home’s unique needs. Moving can be expensive but any veteran homeowner will tell you that there’s always more to budget for—and these issues seem to pop-up out of nowhere, like a broken washer right after you need to patch a leak in the roof. Plan for the unexpected by putting away extra money for emergency house needs. Being a new homeowner can make you more susceptible to being locked out: you have the new keys, you run out to get something and realize that the new key isn’t on your old keyring. You walk outside with the trash, forgetting that the new door locks behind you. This mistake can lead to another one: choosing a locksmith that’s not reputable. In your hurry to get back into the house, it’s easy to forget to do your research and listen for clues that something’s not right. That’s why experts from Lokology Locksmith share an important tip, “Ask the locksmith for an estimate prior to their arrival. If the locksmith cannot give you a quote or a price range over the phone—that should be a red flag.” This is a simple way to test whether a company is reputable to reinforce the quick research you did. It’s exciting to think about how you’ll make your new home feel more like yours with renovation projects. While small changes are to be expected, major renovations should wait. Give yourself time to live in the home, see how it feels, and determine what larger renovations will look like as needs arise. For example, you may find the location of your fridge makes it hard to move around the kitchen seamlessly. This might be a focus of your kitchen renovation that would have otherwise not been considered. As you can see, becoming a first-time homeowner is a lot of work. Adding to that by having a baby or getting married at the same time only increases the likelihood that you’ll make mistakes or become overly stressed. If possible, leave yourself time to get to know what it’s like to be a homeowner and avoid making costly mistakes that come with being stressed, and in-turn, overlooking simple details. There are some mistakes you can’t avoid—but many others that you can. 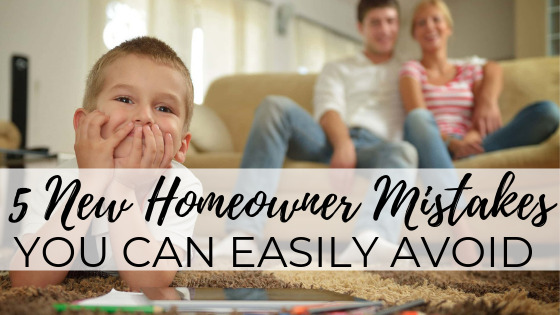 As you get familiar with your role as a homeowner, keep these simple mistakes in mind. If you plan ahead as best you can, you’ll be able to enjoy all the excitement of owning your first home with less stress and frustration. Jessica Thiefels is an entrepreneur and founder and CEO of Jessica Thiefels Consulting. She’s been writing for more than 10 years and has been featured in top publications like Forbes. She also writes for Business Insider, Virgin, Glassdoor and more. Follow her on Twitter @JThiefels and connect on LinkedIn.